You may have heard of the Venture Vermont Outdoor Challenge - a statewide, outside scavenger hunt. 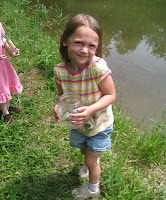 Similar to this program, but designed for licensed child care providers with younger children, Outdoor S'more! is a new program encouraging kids to explore the outdoors (and get rewarded for it). Outdoor S'more! activities range from collecting seeds and sorting them by how they feel (10 points) to finding shapes in nature (5 points per shape). Once the group reaches 100 points, the group sends in photos of them completing activities, their scorecard (shown right), and any other supporting documents, such as artwork or writing, to Vermont State Parks. The reward is a FREE day use visit for the whole group to any of the 52 Vermont State Parks! Score sheets are being mailed to all licensed day care providers in Vermont. You can celebrate completing the challenge by having a picnic, playing games, or going for a hike in your favorite park. One of the challenges of the Venture Vermont Challenge under the INVENT category is to "Create your own outside food recipe (one you enjoy cooking and eating outside)". Many campers have made chicken & vegetable packets over a fire, but Jessica Rouse, Meg Baker, and Asa Rouse-Baker have perfected a few that are sure to please - (and you can earn 10 points towards the Venture Vermont Challenge by making this!) Visit our family camping menu ideas webpage for more. 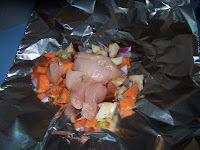 Add about a cup total of chicken & veggies, wrap in aluminum foil and put on coals of the fire for about 15 minutes. And dance fancy free for the evening show. Smugglers' Notch has attracted some bizarre, yet stunning visitors to the park as of late. These visitors of whom I speak, are not our campers, but a species of moth that is unlike anything I, personally, have ever seen before. The species to which I am referring is the Luna Moth. Seen left, the Luna Moth (a.k.a. the Giant Silkworm Moth) with its brilliant pale green wings, a white body, and pinkish legs, sports an impressive wingspan that can reach 4 ½ inches. Once common throughout the US, sightings of this beautiful creature have diminished due to spikes in pollution and habitat loss.